What words need to be written to describe this tool that the picture itself can't describe? Perhaps one of the most graphic tools in all of tooldom, this is the extremely rare gunmetal version of the Fisher's Patent bevel, which is normally found (when one is lucky enough to find one) with a rosewood body. It's speculated that this example, one of two that have surfaced in gunmetal, was used for the exhibition circuit that was fashionable during the second half of the 19th century. 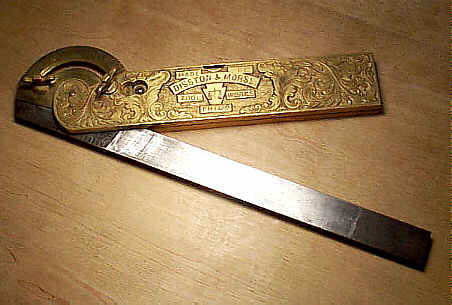 The tool was patented by W.T.Fisher (out of some joint in Tennessee) on June 23rd, 1868. As was common during that time, patentees sought out manufacturers to bring their brainchildren to life. Mr. Fisher entered into an agreement with Henry Disston's company within a company, Disston & Morss, to manufacture this multitool that does nearly everything that the infamous Swiss Army knife does. The tool has a built in level located in the edge that's right above the company logo. A pivoting blade folds out from the body so that the tool can function as a bevel. The blade is graduated over its length. The blade references off a protractor to the left of the tool and is locked in position with a cast floral thumb screw. The protractor itself can rotate and has a point of reference situated in the cutout on the body. The protrator is also locked in position with the same kind of thumb screw. In a day when modern tool manufacturers are held up as the standard by which others are measure, they must cower for cover when faced with a tool as beautiful as this one is. Eat your heart out you modern yuppy toolmaker on the left coast.